Cross and Cutlass: The Battle is Real! So many of us go through our lives in this physical realm that we can hear, see, touch, and taste, and think this is reality. How can we not? It's all we know, right? We hear about another realm, a spiritual one that exists around us, but we have a hard time grasping it, understanding it, and sometimes even believing it. I'm here to tell you that this realm is very aware of you! I'm also here to tell you from personal experience that the spirit realm is much more real than this physical one. The physical realm is only a portion of reality. Like a horse with blinders on, we stumble through life with only a partial view of things. But when those blinders are taken off, we see what we've been missing.... a glorious world with a myriad of colors and textures and sights we have never known. And dangers as well. There are beings that inhabit the spirit realm, both good and evil. I've had personal encounters with both over the years. But during the past few weeks, attacks by the enemy have been fierce in my life. I don't know whether it's because I'm walking closer to God and that makes satan mad or because we are nearly at the rapture and he's throwing all he has at me before I'm gone. Whatever it is, I thought it might be helpful to relay these experiences in case you are or will be facing the same thing. If you are a dedicated Christian who longs to walk closer to Jesus every day, then you are a target and you WILL encounter battle. If you are a lukewarm Christian content with only your "Get out of hell free card" then you need not read further. Our enemy knows us better than we know ourselves. He's brilliant and has been around for thousands of years and has an entire army at his beck and call. He has assigned demons to watch you and your family and report back to him your areas of vulnerability. My area of vulnerability? My kids and grandkids. You can do anything to me but don't you touch my kids. I have a real fear of something bad happening to my children. Recently since I now have 4 grandkids, that fear has translated to them. Thoughts go through my mind of them being kidnapped, abused, and murdered. Whenever that happens, my heart seizes in panic and I feel like I can't breathe. This usually happens at night when I am trying to sleep. Can anyone relate? I know these are just demons and I know what to do. This very thing happened to me a few weeks ago during the night. I immediately told these vile entities to leave in the name of Jesus. They did. But they came back right away. Why? Because my mind went right back to the horrifying thought of my grandkids being kidnapped. Once we entertain a thought like that, we open up a door for the demons of fear to come in. No matter how hard I tried to scatter these thoughts, they kept invading. I kept speaking the name of Jesus. The demons would leave. I'd think those thoughts again. Fear would return and back came the demons. I was in a real battle here and I knew it. These demons were not going to leave me alone as long as I gave them even the slightest crack. But finally, the Lord told me to recite Psalm 91 out loud. (Well, I had to whisper it cause my husband was asleep through all this) I have memorized Psalm 91 and often recite it during the day, so I had no problem speaking the entire thing. (I highly recommend memorizing this and other portions of Scripture) At the end, I praised God for his protection and then boom, the entities left and I fell asleep in peace. Why am I telling you this? The name of Jesus is the most powerful weapon we have in our arsenal, yet sometimes our own weakness can limit its effectiveness. But the name of Jesus alongside the Word of God, with faith. Now, that's invincible! The Word of God spoken from my lips brought peace to my mind and heart, and the name of Jesus scattered the enemy. Recently, I've encountered another vicious attack of the enemy that has come through one of my family members. This, too, is against my grandkids. I won't go into details here, but one thing I've learned is that when this happens, don't get mad at the person causing it. You see, this particular family member is not saved (Yet. The Lord has promised me he will be). When someone isn't saved, they are in the darkness and a slave to satan. Since the enemy couldn't get me through fear, he is now attacking through this person. This person, of course, has no idea he's being used by satan. When I realized that, I shifted battle strategies from fighting this person to fighting the demons making him behave so horribly. When you do that, when you realize who you are really fighting, it changes your feelings entirely toward that person and shifts your anger onto the person causing it. Hence, your battle going forward will be effective. 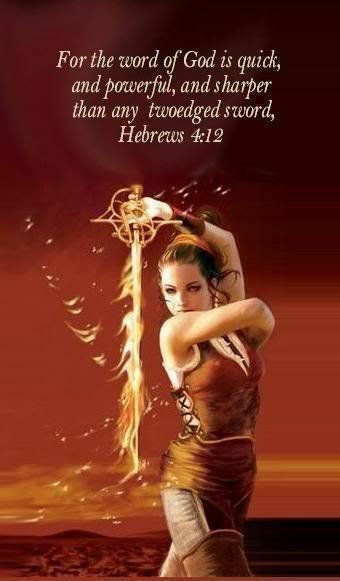 The enemy CANNOT stand and WILL NOT prevail against a Bible-Believing, Dedicated, Child of God with the Word of God in her mouth and the name of Jesus on her lips. Don't ever let him convince you otherwise! I can totally relate. When those demons attack me at night...and it is hard to battle....I sing the Lord's Prayer over and over in my head. I've cried in my pillow thinking of thoughts of my grandkids being harmed, so I know what you are talking about. And yes, the closer you are to the Lord, the more satan will attack. Keep looking up! Hugs, my friend. Yes! This is so true. The attack is real. I need to work on my armour-wearing ... my battle is a little different but ruthless and destructive. And it is wreaking havoc. How I call out the name of Jesus! But my thoughts, like you said, continue to pop back into the wrong direction. That's a tough one. Because it goes beyond just thoughts for me. It is my reality right now. How do you counter it coming from other people? How do you counter it when it affects your kids, but it's out of your control because someone else is doing the harm? My thoughts go to the emotions - anger, frustration etc. - and the situation doesn't change. It is so hard to navigate this. My motto for the past while has been, "Great is He that is in me, than he that is in the world. Greater is He ... greater is He!!!" That, and the idea that I really need to trust Him ... really trust. I've got the Bible study book by Pricilla Shirer - "The Armor of God". But haven't done it yet. Would love to do this one in a group of warriors! I'm so sorry you are in the battle, Caroline! I, too, am being attacked by a family member at the moment. You can't force another person to behave a certain way, but you can bind the evil forces that are causing it in that person. You can pray for them to know the Lord, to be delivered of demons. You can pray for the strongholds in their mind to collapse. Find Scriptures that say these things and then use them outloud to do battle. I'm in the middle of it too. And you can put a hedge of protection around your kids too! Recite Psalm 91 over them and cancel all of the enemy's plans for them. Anyway, hope that helps. The Lord will lead you! Thank you for the excellent post. Now that I have found your blog I look forward to what you have to say on a daily basis! God bless you and keep you and yours. Thanks for coming by, Mommy2xkids! Yep, I agree that we aren't fighting against "flesh and blood, but against the rulers of the darkness of this world." I've been purposefully putting on the armor of God recently. By this, I mean I "literally" act like I'm putting on the belt of truth on my waist, helmet of salvation on my head, etc. I wanted to be armed and protected from anything satan has to throw at me. Jesus Himself quoted scripture when He was being tempted, so I try to do the same when attacked. Thanks for sharing your fears, so we can rally around you in prayer. Thank you so much, Amy. Sounds like you are a prepared warrior! I appreciate any prayers you toss my way! Yes, I love the picture too!! but it's copyrighted. Ugh.